It is estimated that over 1.5 million searches are made for watches every month so having a powerful online presence can be incredibly lucrative. We profiled 9 online watch retailers to see how well they follow SEO best practice and what opportunities there are for improvements. Not only will we look at their link profiles, we will also see how well their websites are set up to maximise how well they can attract potential customers via organic search. Whilst they have recovered well from this penalty over time, they have yet to reach the heights that they previously had. This is a common trend with sites that have had penalties as optimising for some flagship queries becomes more difficult due to the risk involved. This website is now ranking on page 4 for the term “watches” when other competitors rank much higher. For more information on recovering from a manual action penalty, download our guide. However, firstclasswatches.co.uk and swisswatchesdirect.co.uk have very concerning link profiles. 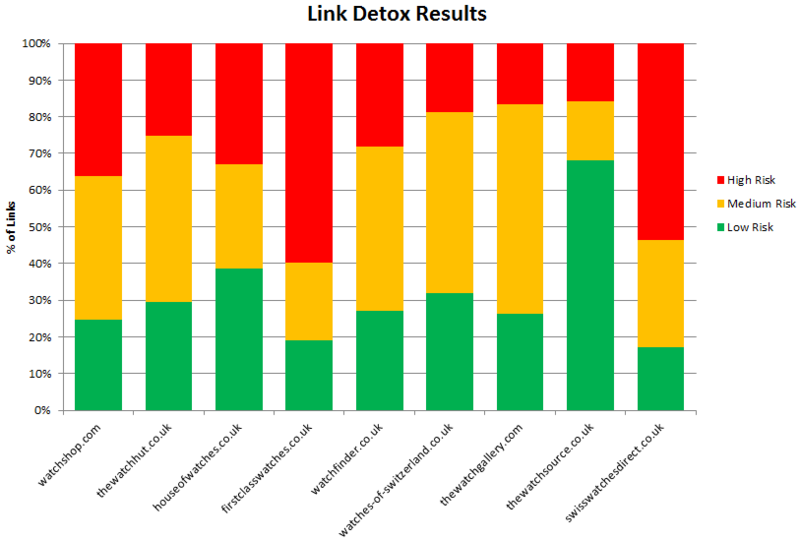 Both of these websites also have had their visibility decrease over the last 2 years, with drops that suggest that they may have been penalised by Google’s Penguin algorithm, which punishes unnatural or manipulative link building. Whilst these websites are performing well in search, they are not performing as well as watchshop.com. Therefore, we need to have a deeper look into their on-site optimisation to determine what improvements can be made to attract as many visitors as possible. A common misconception is that keyword research is just about choosing which keywords to insert into a page. This involves looking at the search volume for keywords which are relevant to a landing page and placing them into title tags, headings and content. The truth is that keyword research is far more important than that. Rather than looking at individual keywords, it is far more important to understand how a user searches for the product that you are looking to sell. Effective keyword research will look at overall trends and behaviour to look for opportunities to drive more traffic to your website. To be most effective, this should be carried out during the development stage of building a website. Another important function of the keyword research is to dispel the myth that SEO is all about targeting a single search query with the most traffic. Whilst this might be true for some websites, for many industries, including watches, most of the search volume that is likely to turn into sales will be found in more long tail key phrases. In the watch industry, a long tail optimisation strategy is a must. From this small list, there are 2 clear trends; brands and gender. This is where the vast majority of search volume can be found and having a website that caters to these search patterns will have the greatest success of having higher levels of search traffic. The key to a successful SEO strategy is to have a website which can more effectively target long tail search queries. When digging a little a bit deeper into the keyword suggestions, a considerable amount of search traffic combines gender and brands. For example, rather than just targeting “armani watches”, why not target “Armani watches for men/women” and similar queries? This will considerably widen the net to attract visitors to your website. 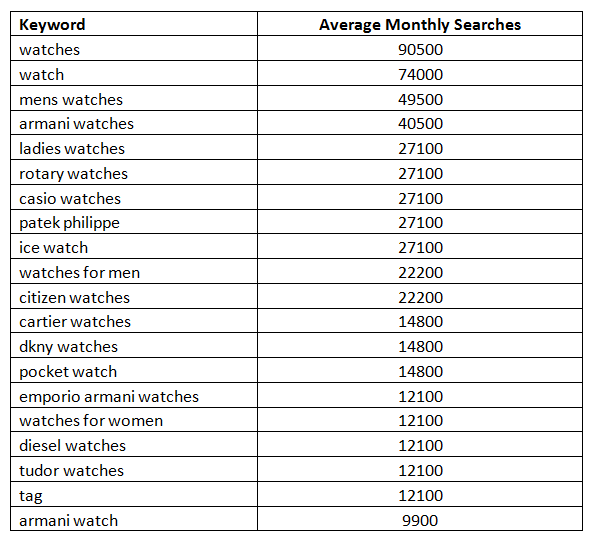 There is also a difference in search patterns with more expensive luxury brands of watch, such as Rolex or Omega. Due to the price of the items, they are far less likely to be impulse buys; users are more likely to do a large amount of research before making a purchase. Therefore, there is a considerable amount of search traffic for ranges or collections within the brand as well as search volume for specific models of watch. Therefore, having a website which is optimised for each stage of the buying cycle is essential. OK, so the keyword research has been done and you have made the wise choice of targeting a long tail optimisation strategy. For an ecommerce website, there are two ways to target long tail traffic; good use of sub-categories and content. Not only can users easily access a top level category for men’s watches, they can also navigate which brand or style of men’s watch they want from any point of the website. In fact, their entire top level navigation is easy to use and is perfect for long tail optimisation. Two other websites, houseofwatches.co.uk and thewatchgallery.com also sub-categorise in such a way, although thewatchgallery.com does not allow navigation from the home page. 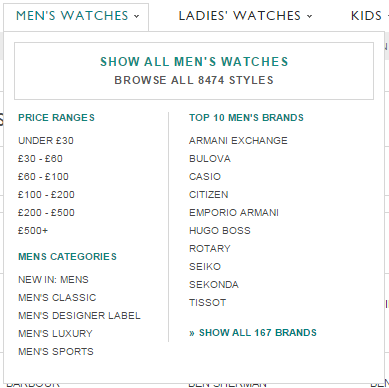 When looking at more expensive luxury watches, watchfinder.co.uk uses a different method of sub-categorisation. Rather than focusing on gender, their sub-categories focus on specific collections within a brand. This will improve their visibility for search terms where a single transaction can be worth thousands of pounds. The next method of targeting long tail traffic is by having quality content and titles on a page. Not only does having good content on a page increase its relevance for chosen keywords, it widens the net on the number of keywords a single page can target. As with many ecommerce websites, many of the brands analysed do not make use of content on their category pages. Some websites, such as houseofwatches.co.uk and houseofwatches.co.uk put a couple of sentences at the bottom of a long page where users will never read it and search engines will take it less seriously. One website which does have substantial content on its category pages is thewatchhut.co.uk, which has over 200 words of unique, descriptive content which explains the benefits of their service. Although content is most effective when it is at the top of the page, this content is in the side-bar and written with the user in mind. Having a good level of content for product pages is also important, especially for luxury watches, where customers will be expected to invest a large amount of money. All product descriptions should be unique and talk about its benefits. One website to do this well is watchfinder.co.uk, including this example. Page titles are one of the most effective on-page elements for optimising a page. For luxury watches, getting this right is essential as potential customers will have done their research and will often be looking for a specific model of watch. There are 2 basic rules for creating an effective title tag; keep it simple and descriptive. For product pages, having the complete name of the product is a must – any extra details such as the material used or the type of strap would be a bonus. Websites who have good product titles include thewatchhut.co.uk and thewatchgallery.com, which not only put the name of the specific model of watch, but also put which gender the watch is for in the title. The worst culprit is swisswatchesdirect.co.uk, which has a random-looking catalogue code at the front of the title and do not have the name of the watch, like in this example. A similar example is this watch from thewatchsource.co.uk. Whilst they do have the watch name in the title, they also have an ugly catalogue code and the product-specific information is kept to a minimum. Another bad example of product titles comes from watches-of-switzerland.co.uk, who also do not put the name of the watch in all of the product titles, such as in this example. An old SEO tactic to target long tail search queries was to create a large number of landing pages to target as many different combinations of keywords as possible. Then in early 2011, Google launched the Panda algorithm. The official purpose of this update was to reward websites with good content and punish those with bad content. One of the ways that it defined poor content was “overlapping”. This occurs when multiple pages have similar content and serve a similar purpose. If all of this content can be served with a single page, then having multiple pages does not provide a valuable user experience. This hit many sites that had a long tail optimisation strategy. Whilst this is good for user experience, these pages add little SEO value. Over-reliance on this type of page could be seen as over-lapping. Three of the websites; thewatchgallery.com, houseofwatches.co.uk and watchshop.com use canonical tags to prevent this. The sites are structured in such a way that these price-filtering pages redirect search engines to their top category page without looking manipulative. Upon first inspection, this website seems ok, if a little dated. The navigation is easy and the content is not duplicated on other websites. So we ran the site through the Screaming Frog crawler and found a massive number of product pages. Since there are lots of little variations that can be made to a product, a single model of watch can have multiple pages. For example, this Omega watch has TWELVE pages with almost identical content. This trend, repeated across the whole website, is the sort of practice that makes Panda gets its claws out. Handling multiple styles for a single product is difficult. The best solution is to either create completely unique content for every product variation or to handle all the different styles from a single URL. Whilst this website does not have the same over-lapping issue that swisswatchesdirect.co.uk has so a full content and technical audit is required. So far, we have discussed the essentials of creating good landing pages for long tail optimisation, including the results of keyword research and having great content. However, having a good website structure which search engines can crawl properly is just as important. The key to having a good website structure is for the navigation to be simple and logical. Ideally, no sub-category page should be more than 2 clicks away and most products should be no more than 3 or 4 clicks away. This is done effectively by watchshop.com and houseofwatches.co.uk who allow users to navigate to most of the sub-categories from the top navigation on the site with easy access to any other sub-categories. One website which does a poor job is swisswatchesdirect.co.uk, where some sub-categories require four clicks before any products can be found. Whilst the navigation on the watches-of-switzerland.co.uk website is fairly simple, they do not allow users to browse by gender, thus considerably narrowing their potential to attract customers through search. It is common for websites to have multiple pages with the same content for a variety of reasons. To prevent issues with duplicate content, a canonical tag can be placed in the code to tell search engines which version of the page is correct. When implemented correctly, it can significantly improve the performance of a website. When implemented incorrectly, it can prevent important pages from being indexed by search engines. Unfortunately, none of the profiled websites have implemented canonical tags correctly. For example, when there is pagination every page number should be indexed individually to allow all of the products to be crawled by the search engines. A common mistake highlighted by Google’s own blog is to link all of the paginated pages to page 1 with the canonical tag. This mistake has been made by watchshop.com and thewatchgallery.com, which otherwise have very good websites. The consequence is that only page 1 of all of their category pages will be indexed. A more dangerous mistake is to prevent entire sub-categories from being indexed, like with thewatchhut.co.uk. This website allows users to browse brands by gender, but their canonical tags all point to the top category page. This means that the website will struggle to attract long tail search queries. This practice could also be seen as an attempt to manipulate search engines which would go some way to explaining why they have been penalised by the Panda algorithm. Back in August 2014, Google announced what many of us already suspected that having an HTTPS website is a ranking factor. This means that websites that use a secure server are treated more favourably in search results as they offer more protection to their users. Overnight, thousands of webmasters then changed their website to HTTPS with very little understanding of best practice and the consequences of doing it wrong. Unfortunately, firstclasswatches.co.uk was one of these websites. The simple truth is that whilst having an HTTPS website is a ranking factor, it is a very small ranking factor. Whilst the website’s address might look the same, to search engines it can be treated as an entirely new site. If you choose to migrate to HTTPS, it is essential that ALL pages are redirected to the new URL using a 301 (permanent) redirect. This will tell search engines that the website has permanently moved and most of the authority of the old website will be passed to the new site. From our initial inspection of the website, their on-site optimisation seems good. So it begs the question as to why their visibility is so poor. Unfortunately, we do not have access to their Webmaster Tools account or have any historical data about the site. What we can do is to have a look at previous versions of the site using archive.org. What we found was a poor looking website, which had not only been hacked to display spammy links, but also used promotional images which are unlikely to be authorised. It is possible that they may have been penalised by Google, but a full audit of their Webmaster Tools account and a full technical audit of the website will be required, which are beyond the scope of this blog. For such a lucrative industry, it is essential to have the perfect website which can attract as many visitors as possible. Whilst some of the websites we looked at do a very good job, none of them are without their flaws. For some websites, improvements can be made with something as simple as adding good quality content in important areas. For others, a complete overhaul may be necessary to remove issues with the Panda algorithm. Full technical and content audits should be performed on each website to determine the extent of the work required to improve the visibility of the websites. This website does a good job of long tail optimisation and is out-performing all the other sites in terms of visibility. However, they have not been able to reach the same heights as they were once at. A full analysis of their link profile is recommended to determine how to fully move on from their past penalty and a quality outreach campaign moving forward can help to improve their visibility further. This website is also light on content on category pages. Creating descriptive content to add context to their pages can have a massive impact. This website allows users to browse their sub-categories, but does not allow search engines to do the same. This removes a large amount of their ability to attract traffic from long tail search queries. A restructuring of the website and correct implementation of the canonical tags will vastly improve their long tail optimisation. This website has also had issues with Google’s Panda algorithm. Content and technical audits are recommended to determine where improvements can be made. For example, there is a mobile website which is not implemented correctly, which results in content duplication. This website looks ok at first glance. However, their visibility is almost non-existent compared to competitors. It is possible that they are still being punished for issues with the old website, but a full set of audits is required to assess this website. This website has not implemented their HTTPS website correctly, which is seriously harming their visibility. Before any other changes should be made, this issue should be fixed as soon as possible. This website also does not target long tail search queries very well. Implementing sub-categories to be able to browse watches by gender could seriously improve their organic search visibility. These are one of the leading retailers of second hand luxury watches. However, their lack of gender-based sub-categories could be harming their visibility. Their pages titles on their sub-category and product pages could also be improved. They have international versions of the website which are identical. Whilst the international sites are targeting different countries, it is still best practice to have unique content on each version. Further analysis should be carried out to determine how well their international SEO strategy is implemented. This website has done a great job of improving its visibility over the last couple of years. However, their navigation could be improved and they need better use of sub-categories to improve their long tail optimisation. This website is rapidly improving its visibility and is very well set up for long tail search queries. In general, pages which are linked to from the top-level navigation tend to have greater authority. Therefore, effective keyword research can help to determine which sub-categories to include in this section of the website. Recently, the visibility of this website has increased a lot, although it is still way behind some of its competitors. Whilst a good outreach campaign will help, improvements to their navigation and page titles are necessary. Also, this website looks very dated, especially when they are selling luxury (and expensive!) watches. Whilst this website, also looks dated, they have a lot of trust factors on the home page such as their latest Trust Pilot reviews. The main issue is with the large amount of over-lapping which has led to a Panda penalty. Changes should be made to the product pages to allow several variations to be viewed from a single URL and improvements to their overall content should be made. For more information on improving on-site SEO performance, download our simple guide to SEO. Like some expert suggestions on how to improve your ranking and gain an edge on the competition? Request an in-depth SEO analysis of your website today. E-cigs: Whose search visibility has gone up in smoke? We analysed the organic search visibility of 5 airport parking websites to see who’s flying high and who’s taking a nosedive. Retailers, are you making the most of online?